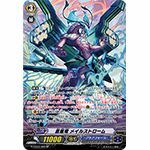 [AUTO](VC) Generation Break 2:[Counter Blast (1) & Choose a face down card named "Blue Wave Marshal Dragon, Tetra-boil Dragon" from your G zone, and turn it face up] When this unit attacks a vanguard, if you have a heart card with "Blue Wave" in its card name, you may pay the cost. 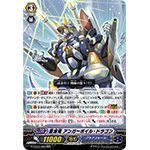 If you do, until end of turn, this unit gets drive-1, and "[AUTO](VC)Wave-4th time (This ability is active during the specified battles of each turn):[Choose a card from your hand, and discard it] At the end of the battle that your rear-guard attacked a vanguard, you may pay the cost. If you do, [Stand] this unit.". 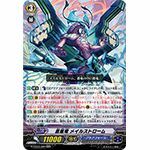 [AUTO](VC) Generation Break 2 Wave-2nd time (This ability is active during the specified battles of each turn):When this unit attacks a vanguard, this unit gets [Power]+5000 until end of turn, choose up to one of your rear-guards, [Stand] it, and it gets [Power]+10000 until end of turn. 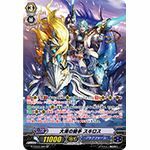 [AUTO](VC):During your turn, when your unit named "Blue Wave Marshal Dragon, Tetra-boil Dragon" Stride, choose one of your vanguards, until end of turn, it gets [Power]+3000, and "[AUTO](VC)Wave-2nd time (This ability is active during the specified battles of each turn):When this unit attacks a vanguard, choose up to two of your rear-guards, [Stand] them, and they get [Power]+3000 until end of turn.". [AUTO] Limit Break 4:[Counter Blast (1)] When an <<Aqua Force>> rides this unit, you may pay the cost. 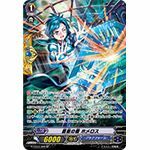 If you do, choose one of your vanguards, until end of turn, that unit gets [Power]+10000, and "[AUTO](VC)Wave-4th time or more (This ability is active during the specified battles of each turn):When this unit attacks a vanguard, draw a card, choose one of your opponent's rear-guards, retire it, and until end of that battle, your opponent cannot call grade 0 cards from hand to (GC).". 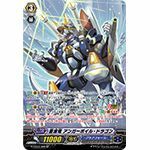 [AUTO](VC)Wave-3rd time or more (This ability is active during the specified battles of each turn):When this unit's attack hits a vanguard, search your deck for up to one card with "Maelstrom" in its card name, reveal it to your opponent, put it into your hand, and shuffle your deck. [CONT](VC) Generation Break 1:All of the units on (RC) in your front row get "[CONT](VC/RC/GC):Resist (This unit cannot be chosen by the effects of your opponent's cards)". 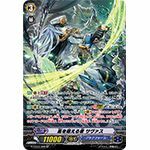 [AUTO]:When this unit is placed on (VC), choose up to one of your units, and until end of turn, it gets "[AUTO](VC/RC) Wave－Third or more (This ability is active by the specified amount of battles in a turn):When this unit attacks a vanguard, look at five cards from the top of your deck, search for up to one grade 3 or greater card from among them, reveal it to your opponent, put it into your hand, and shuffle your deck.". 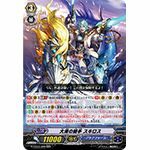 [AUTO]:[Choose a card from your hand, and discard it] When this unit is placed on (GC), if you have a vanguard with "Blue Storm" in its card name, you may pay the cost. 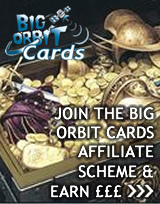 If you do, choose up to one of your units that is being attacked, and that unit cannot be hit until end of that battle. 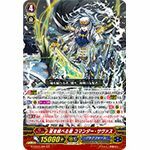 [AUTO](RC) Wave-Third or more (This ability is active by the specified amount of battles in a turn):[Soul Blast (1)] At the end of the battle that this unit boosted, if you have a vanguard with "Blue Storm" in its card name, you may pay the cost. If you do, return this unit to your hand. 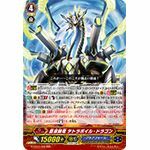 [ACT](VC)1/Turn:[Choose a face down card named "One Who Rules the Storm, Commander Thavas" from your G zone, and turn it face up] Choose up to one of your rear-guards, until end of turn, it gets [Power]+5000, "[CONT](RC):This unit can attack from the back row. 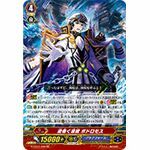 ", and until end of turn, this unit gets "[AUTO](VC) Generation Break 3 Wave－Fourth (This ability is active by the specified amount of battles in a turn):When your unit attacks a vanguard, choose three of your opponent's rear-guards, your opponent chooses one from them, and retires it.". 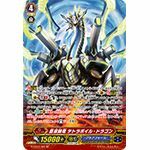 [AUTO](VC):[Choose a face down card named "Torrential Ripple, Podromos" from your G zone, and turn it face up] When this unit's attack hits a vanguard, if you have a heart card with "Ripple" in its card name, you may pay the cost. 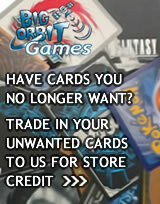 If you do, look at five cards from the top of your deck, search for up to two cards with "Ripple" in its card name from among them, call them to separate (RC), and shuffle your deck.